Animator. Nationality: Canadian. Born: Montreal, 19 March 1933; emigrated to the United Kingdom, 1955. Career: Worked for Disney and United Productions of America (UPA) in early 1950s; 1955—moved to England: first animated film, The Little Island , 1958; his own studio produced animated films, commercials, and special effects and titles for live-action films; 1992—forced to close studio. Awards: Academy Award, for A Christmas Carol , 1971; Special Achievement Award and Visual Effects Academy Award, and two British Academy Awards, for Who Framed Roger Rabbit? , 1988. "Animation and The Little Island ," in Sight and Sound (London), Autumn 1958. Screen International (London), 18 June 1977. Films and Filming (London), April 1982. Screen International (London), 11–18 December 1982. Television Weekly , 25 May 1984. Films and Filming (London), August 1988. The Listener (London), 20 October 1988. Sight and Sound (London), Spring 1963. Films and Filming (London), October 1963. Roudévitch, Michel, in Cinéma (Paris), no. 98, 1965. Cinema TV Today (London), 9 December 1972. Filmmakers Newsletter (Ward Hill, Massachusetts), May 1973. Monthly Film Bulletin (London), October 1973, additions in February 1974. Movie Maker (London), December 1975. National Film Theatre Booklet (London), April 1985. Film Comment (New York), July/August 1988. Times (London), 1 September 1989. Films in Review (New York), November-December 1995. Duncan, Celia, in Screen International (London), 22 March 1996. Animato! (Springfield), no. 35, Summer 1996. 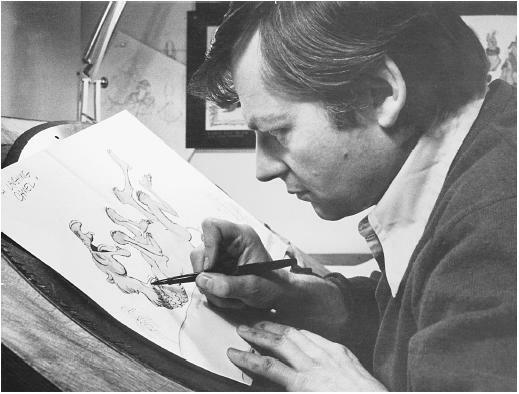 By general informed consensus, Richard Williams is probably the finest animator alive—in Chuck Jones's words, "the only 'genius' genius to come along in animation in years." His style—fluid, dynamic, assured, painstakingly detailed—consciously harks back to the golden age of full animation, when the Disney studio was at its creative peak: the years of Fantasia , Pinocchio , and Dumbo . Williams himself, though heartily sick of being dubbed "the new Disney," readily acknowledges his indebtedness. "Nobody has ever surpassed Disney. . . . He did everything. We have to go back and study him." No other contemporary animator is more constantly aware of the tradition he inherits—though it may be that this awareness has served to inhibit as much as to inspire him. "An animator," Williams has said, "should be able to draw like Degas." He has never been shy of invoking the highest possible standards, both for himself and for those who work with him: not only Disney, Jones, and Max Fleischer, but the weightiest names in the whole field of human art. "I don't think in terms of animation. . . . My standards come from music, painting, and literature. . . . I'm in the same business as Goya and Rembrandt. I may be rotten at it with nothing of the same quality and talent, but that's my business." Not surprisingly, his view of the cheap, limited-animation material prevalent on television is dismissive. "It's like the three-chord trick in music. It's quick, easy, and you don't need any real training to do it. . . . But don't call it animation." Williams's first film gained him immediate and worldwide renown. The Little Island , which took three years to make (and is said to be the longest film ever drawn and animated single-handedly), is a half-hour philosophical allegory; Roger Manvell called it "at once absurd and violent, madly serious and wildly funny." Three small, pear-shaped people land on a desert island. They personify, respectively, Goodness, Beauty, and Truth. Goodness and Beauty, dangerous monomaniacs, soon clash, piling increasingly grandiose structures on their rival concepts, until they metamorphose into ferocious monsters whose vast collision shudders the globe. Truth, meanwhile, bemused and conscientious, keeps score on a blackboard which takes on the shape of a nuclear bomb. The film uses no words; the most complex abstract ideas are brilliantly conveyed in purely visual terms. The Little Island picked up a stack of awards, and Williams—who founded his London studio on its success—was hailed as an animator of infinite promise. Much of his finest work, from a technical standpoint, has been seen in commercials, and in title sequences for live-action features. Far from regarding advertising as a demeaning chore, to be undertaken with disdain, Williams always welcomed the chance to extend his team's range, comparing commercials to calisthenics: "You try new things, you get all this extra technique." His studio, turning out over 100 ads a year in a staggering variety of styles, was reckoned probably the best, and certainly the most versatile, commercial animation house in the world. Several of Williams's commercials became classics, while his titles often outclassed the films they adorned. In Tony Richardson's The Charge of the Light Brigade , his superb linking passages, based on Victorian political cartoons, were widely admired; the rest of the film flopped. "It's a pity," Pauline Kael remarked acidly, "that Richardson didn't leave the Charge itself to Williams." Yet after all the years of limbering up, all the flexing of creative muscle and development of technique, the Big Event is still to come. From time to time tantalizing fragments—storyboards, sketches, even sections of film—have surfaced: I Vor Pittfalks , the rise of a demagogue; Circus Drawings , based on sketches Williams made in Spain; a treatment of Gogol's Diary of a Madman ; all, to date, unfinished. And for more than 25 years there was the great Asian epic, "banana-skin Ali Baba or slapstick 1,001 Nights," that grew out of illustrations for a book about the legendary wise fool, Mullah Nasrudin. Started in 1967, the project changed titles a dozen times (though The Thief and the Cobbler was the longest-running favorite) and was repeatedly announced as "nearing completion." Williams promised that when it eventually appeared, it would "change the face of animation." For a while, it seemed the arrival of this long-awaited magnum opus might be speeded by the success of Who Framed Roger Rabbit? , which integrated live-action and animation at an unprecedented level of technical complexity. It was Steven Spielberg, producing the film in tandem with Disney's Touchstone Studios, who persuaded Williams to provide Rabbit 's animated element. Technically dazzling and packed with in-jokes for animation buffs, the film triumphed at the box office and gained Williams a Special Achievement Oscar—the first animator to win one since Disney himself. This international acclaim, Williams hoped, would help him raise funding; he could pull out of commercial work and concentrate on finishing The Thief . But potential investors feared that the release of Disney's Aladdin might spoil the market, and in 1992, Williams's studio, overwhelmed by debts, laid off all its staff and ceased operations. Taken out of his hands by a Los Angeles completion bond company, his film was radically altered against his wishes and finally released (as Arabian Knight ) in 1995. It flopped dismally at the U.S. box office. Williams has plans to return to production with two animated features "based on ancient stories." But for the time being, doubts must still remain whether Richard Williams is not so much ?the new Disney? as the Orson Welles of animation—a prodigious talent foundering amid a mass of incomplete projects.